I’ve been looking at/reading/ studying my book about Fabric Science. I’ve also been watching as many videos as I could find about textiles and the industry, printing, and such. I’ve got more to learn, of course! The Textile industry isn’t quite dead in the USA. Interestingly enough, I found a fascinating video on the NC textile industry called “Still Standing”. It’s here. And it’s worth a watch. So, next time you are sewing and want to watch something informative, check out this one! Because the textile industry is so big - and so broad and I’d never get finished, I am going to try to keep this whole series focused on quilting cottons or at least cotton fabrics. But I need to cover a few of the basics first. Here’s the problem - Cotton is a fiber that can be made into fabrics - a type of material that is used to make up a fabric, but flannel is a fabric with a special finish. You can have all kinds of flannel fabrics including cotton, poly cotton, wool or something else. One time many years ago when we worked at a children’s home, we were sometimes donated road kill (deer). Yes, we were. We knew our teenage girls would have a fit if they had known they were eating “Bambi”, so I tried to fix the meat in the crock pot in a way that was somewhat disguised - as a stew or goulash type of thing. I remember one of our suspicious girls one time asking me if it was beef while eating “Bambi’s mom”. I answered her, “It’s a roast!” Well, good for me that she didn’t know enough about meat to answer that one or even ask more questions. Every time I see the question, “Can I mix cotton and flannel” I think of the deer/roast incident! For today, I’m skipping right over the idea of fibers - but I’ll come back to those. These are fabrics where the yarns/threads are put together, or “woven” on a loom. Here’s a picture that shows an old timey loom. 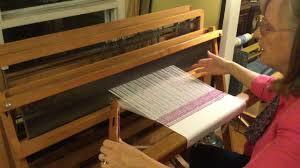 The fibers are placed first lengthwise on the loom, called “warp” and then across - called “weft”. When you were young and made those pot holders on a loom and first put the stretchy loops across and then took your crochet hook and wove above and below those warp threads/loops, you were weaving. True, your “threads” were stretchy, but you were weaving. This is where we will spend a lot of our time talking about fabrics and such as we think about cotton fabrics for quilting since most of us use woven cottons in our quilting projects. I found a short video about woven fabrics. This may be TMI, however. - These are fabrics where the threads or yarns are knitted together - think sweaters, socks, and other stretchy fabrics. We don’t usually choose these fabrics for quilting, though people do make t-shirt quilts and the typical t shirt is a knit. If you know how to knit with knitting needles, then you’ve created “knit” fabrics. Some people knit with their fingers as well. Here’s a short video explaining the difference between woven and knit fabrics. In the video shown above about the NC industry, the narrator talks about nonwovens as being something interesting for the future of the textile industry in the USA. These are neither woven nor knit - but often the fibers or filaments are sprayed onto sheets to form a sheet of fabric. I think the most common way I’ve used nonwovens (in quilting) is in interfacing— it’s been pretty inexpensive. My interest is piqued, and I’d like to read more about nonwovens. We mostly don’t use them in quilting, though, so they probably won’t enter into this series much (except maybe as batting - gotta think about that one)! Here’s a short video about nonwovens. And there you. It’s a short and simple lesson today. But a necessary “basic” to understanding fabrics that we work with daily as we make quilts! 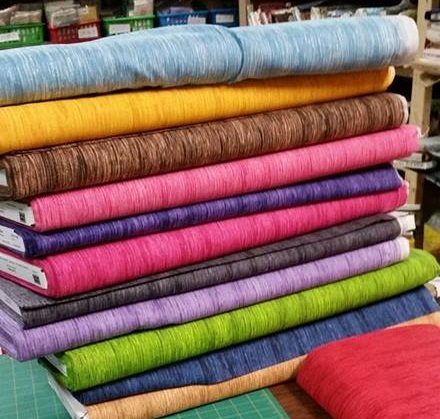 Some of the woven fabrics that the Quilted Twins carries! This is a bright, cheerful floral print. Colors included are white, yellow, orange, blue, and lime green. The background is purple. This is a bright, cheerful floral print. Colors included are fuchsia, orange, aqua, light pink, and olive green. The background is eggplant. Fabric colors may vary slightly from what is portrayed since screens vary so much. A delightful array of artsy flowers on a textured white and cream background. Design of flowers and dragonflies on a textured cream background. Colors included are hunter green, burgundy, purple, and royal blue. Dark pink flowers and buds accompanied by small blue flowers float over dark pin dots on a white background. This is a bright, cheerful floral print. Colors included are white, blue, aqua, fuchsia, peach, yellow, pink, and teal.